At Ameritex Movers, we are committed to making moves as hassle and stress free as possible. Moving in general is regarded as tiresome and tedious, but with us, that’s not the case at all! Since 2001, we have been considered amongst the best Houston movers, striving to provide a stress-free moving experience, which is our sole mission. Located in the heart of Houston, we are Houston movers primarily serving the city and its surrounding areas. However, we are also licensed to cover all of Texas. This means our stress free moving service is available for clients in Austin, Dallas, and San Antonio as well! Our motto at Ameritex is “We Love Moving and Love Making Moving Stress-Free!” – because believe it or not, we truly enjoy what we do. Our passion and enthusiasm has been the secret to our growth to be Houston movers who began as a small company but soon expanded to become a full service moving company in Houston. Our approach to moving it simple: always think Outside the Box and deliver a Stress-Free Move! This approach underlines our unique services, optimized for each client. So whether you have to move two pieces of furniture or an entire house, you can rely on us to provide the best service to you. Wouldn’t it be terrific if everyone had professional movers they could count on? Imagine hiring a moving company, and getting the same kind of quality help that you would receive from your own family and friends. At Ameritex, that’s exactly the kind of service we strive to provide for all our customers — every move, every time. We are a team of honest, caring professionals with a passion for moving and for our customers. We believe in building authentic relationships to last a lifetime. That’s why we’re available for you at any time, for any reason. We want to be your go-to for everything moving-related. And while we’re at it, we’d like to change the moving industry for the better. Find out what a breath of fresh air the moving experience can be when you book with Ameritex Movers. At Ameritex Movers, we provide comprehensive moving solutions. We realize there are many things that are stressful in a move than just the actual move! Therefore, we provide Moving, Packing and Unpacking, Packing Supplies, and Truck Loading and Unloading services. Our services are offered for home moves, apartment moves, and office moves. Ameritex Movers’ experienced and enthusiastic team of movers are real stars, always on their feet, ready to cater to the comfort and satisfaction of our clients. All our services are aided by state of the art equipment. Our mighty fleet of thirty 24-foot International brand box trucks is the core of our moving company, efficiently conducting moves to and from Houston and its neighboring cities as well as other areas in Texas. Apart from being reliable and professional Houston movers, did you know we are the only moving company to offer you a Stress-Free Move Guarantee? With this guarantee, we ensure that our service will be top notch – punctual, reliable, safe, and stress free or we’ll pay you. Additionally, we provide free shrink wrap and furniture pads to safely wrap all your items. We also offer the free use of three wardrobe boxes and a GoGoCart, making your packing and moving even much easier and more efficient. We look forward to being your moving company choice when it comes time to relocation in, out and around Houston. 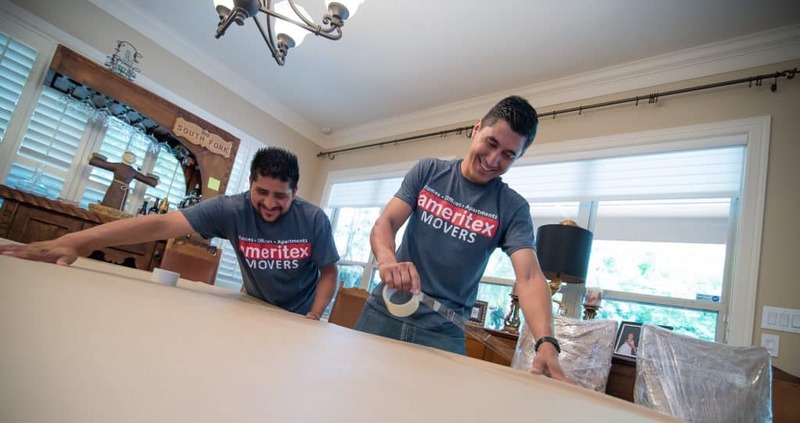 Let our team at Ameritex Houston Movers help you save time, save money, and save the stress of moving. At Ameritex Movers, our company’s mission is to deliver every single customer with a Stress-Free Move. It doesn’t matter if you are moving into a studio apartment, large estate, or townhouse — each move we perform receives the same treatment, care, and efficiency. We are passionate about providing a Stress-Free Move because moving is one of life’s most stressful events, and we want to transform it into one of life’s most exciting events. We love moving, and we strive to share that with you. Our office team coordinates all of the small details of your move so you don’t have to worry. Your movers will arrive right on time. Our team stays in contact with you every step of the way. We work quickly and efficiently, saving you time and money. We are the only Houston movers to provide a Stress-Free Move Guarantee. 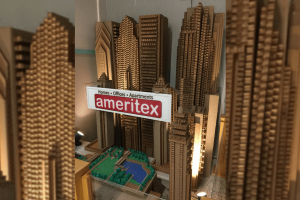 At Ameritex, our “Think Outside the Box” philosophy guides everything we do — from providing a Stress-Free Move to volunteering in the community. We strive to inspire our team and community to Think Outside the Box by encouraging fun and creative ways to solve everyday problems. Whatever creative outlet you decide to use, thinking outside the box directly impacts your life and the lives of others around you. We believe that each and every person is essential to the human experience, both in our community and beyond. All it takes it a desire to make an impact and some imagination. As you can see, we are passionate about Houston area kids. 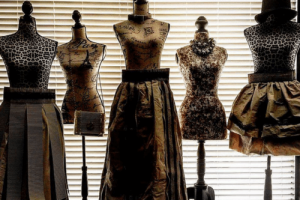 We encourage them to use recycled materials to make something completely new. Packing and moving materials happen to be a great medium to work with. Within each child is a creator or inventor, and we do our part to try to bring that out. But it doesn’t stop there. By partnering with area schools, universities, museums, and food banks, we make connections to last a lifetime. In addition, this paves the way for even more events and community outreach. We strive to inspire as many people as possible, who will go on to create a ripple effect in their own neighborhoods. Our team would like to encourage everyone in our community to think outside the box. We firmly believe that inspiration lies within all individuals, just waiting to be set free. So find your inspiration and give it your all — you won’t be sorry. Read our latest press releases and find out what we’ve been doing to improve the community. Follow us on social media, subscribe to our YouTube channel, and watch some of our awesome videos!